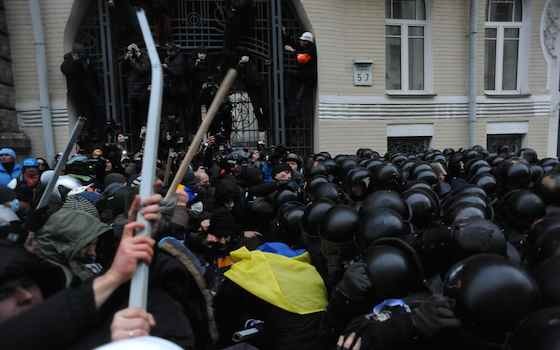 John Brennan of the CIA was in Kiev recently, and the Russians claim that the United States is demanding force. There have been rumors of U.S. mercenaries to back up the Ukrainians, whose own forces seem divided and may be incapable of dealing with the uprising -- certainly so, if it turns into a conflict with already-infiltrated Russian special troops, or brings a border crossing by Russian regular forces. The last I would doubt will happen because it could so easily spin out of control. The commitment of American mercenaries would be disastrous. The American people don't want to fight the Russians, and the Russians would be mad to attack NATO forces or the Baltic States. But I am sure there are people in Moscow just like the people in Washington who say "if we don't follow through -- if we don't 'stand our ground' -- we'll lose our credibility." You can hear that already from the Neo-Conservatives in Washington. How much credibility does the United States have left to lose after defeats in Vietnam, Iraq, Libya and -- now impending -- in Afghanistan? Even in dealing with Israel, the U.S. is now treated by the Netanyahu government and its right-wing cabinet ministers and political allies with studied insolence and defiance. Neither in Washington nor Moscow does it seem understood that any intervention into another county's ethnic or civil struggle invites disaster. It is easy to intervene -- you have allies already there. But you also have a built-in resistance force which soon will make itself known. The Russians have automatic allies in the eastern and southeastern regions of Ukraine, Russian-speaking people who have deep cultural and historical attachments to Russia. But three quarters of the Ukrainians are Western-leaning, whose sense of allegiance is to Central Europe, where once they were members of the Lithuanian-Polish and Hapsburg Empires, and where they now can see themselves becoming members of the prosperous and successful European Union, allied to NATO and the United States. It is easy to turn people against one another, but that works both ways. Look at the former Yugoslavia. Serbs, Croatians, Slovenes, and Bosnian Muslims got along well enough, if uneasily, from the union imposed on them in the First World War settlements -- until Serbia suffered a new attack of an old disease, Serbian nationalism, after Tito died in 1980. Then Yugoslavia blew apart with ferocious intolerance and beastly war between people who formerly had been neighbors. There have been reports from newly-Russian Crimea which suggest that the same dreadful disease has broken out there, between the Russophone and Ukrainian-speaking peoples who lived together peacefully until a couple of weeks ago. To set such hatred loose in the rest of Ukraine would be a despicable crime. But it would inevitably follow open conflict between the two parts of the Ukrainian people -- each side with foreign sponsors. If the Russians were to try to seize all of Ukraine again, Ukrainians -- including many Russian-speakers -- would fight again, either against the Russian army, or as the same kind of underground force by which many of the Ukrainian people tried to regain their independence after the Second World War. Some of those who did so had fought with the German army against Stalinism, just as the Finnish nation fought on Hitler's side to recover the territory that had been stolen from Finland by Stalin. That is why Russian propagandists today like to call the western Ukrainians "fascists." Some undoubtedly were during the war and after 1945 -- and more of them were Stalinist Communists. Take your choice. Each had his or her reasons. The only practical solution to the present situation is negotiated administrative partition of the Ukrainian nation, and "Finlandization" (neutralization) of the country in its international relations, all of this underwritten by Russia, the E.U. and NATO. "Next Step in Ukraine Crisis is Unknown"